The General Plan Update library is your one-stop-shop for all documents related to the General Plan Update. This page will be updated throughout the Update process to provide you with all project newsletters, reports, and draft and final documents. Sign up for email updates to ensure you know when new project milestones are published! For this phase of the General Plan Update, the City will release the elements individually, and the City Council and Planning Commission will hold study sessions to review the draft elements. Keep an eye out for e-blasts announcing study sessions. All are welcome to attend these study sessions and encouraged to provide feedback through the Feedback page, or by directly emailing uc2040@unioncity.org. Each Element undergoes a series of revisions as part of the General Plan Process. The links below the title of each Element show the different versions of the draft Elements, as well as feedback collected as the City releases revised draft Elements. 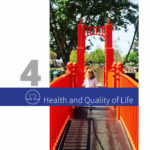 The Health and Quality of Life Element promotes a positive physical, social, and economic environment that supports the overall well-being of its residents. The purpose is to promote a healthy lifestyle and improve residents’ quality of life by ensuring access to parks and recreation, healthy foods, health care facilities, as well as resources and programming that enrich people’s lives. This element also addresses potential environmental justice issues within the community consistent with SB 1000, which was informed by preparation of an environmental justice analysis that can be accessed here. The Health and Quality of Life Element is the ninth and final element in the Union City 2040 General Plan to be publicly released (click here to find out more about what a General Plan is). 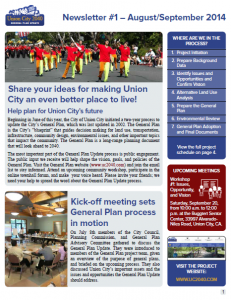 Notice is hereby given that Union City is updating its General Plan. As Lead Agency under the California Environmental Quality Act (CEQA), the City has determined that the update may have a significant effect on the environment and that a programmatic Environmental Impact Report (Program EIR) will be prepared to evaluate these potential effects. 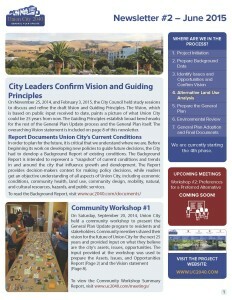 Pursuant to Section 15082 of the CEQA Guidelines, Union City is soliciting input on the scope and content of the EIR. Detailed information about the comment period (October 23, 2018-November 21, 2018) and a scoping meeting on November 8, 2018, are contained in the NOP. 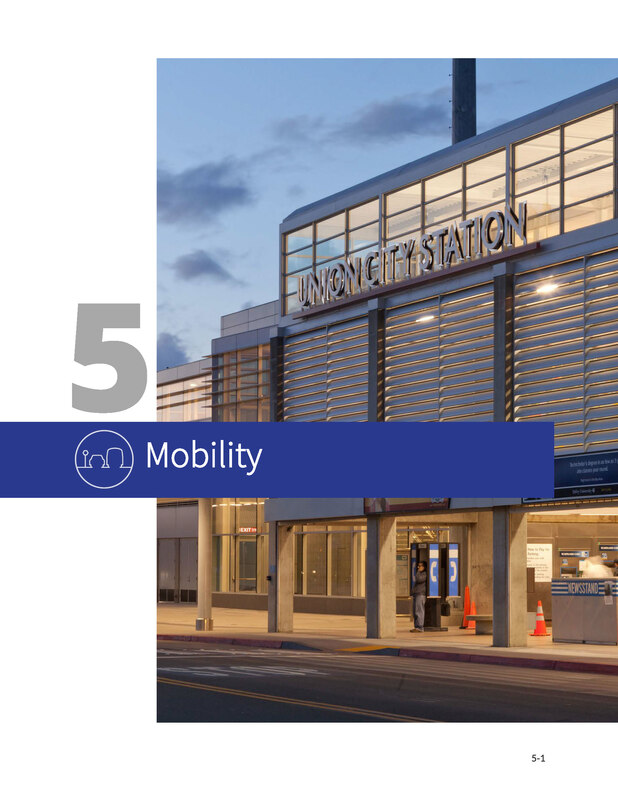 The Mobility Element addresses the movement of people and goods in and around Union City. It works in tandem with the Land Use Element to create a more livable city, where residents can travel safely, easily, and affordably using a variety of transportation modes. The Mobility Element seeks to create an efficient,safe, balanced, and integrated multi-modal transportation system that is accessible to all users. The Mobility Element is the eighth of nine elements in the Union City 2040 General Plan to be publicly released (click here to find out more about what a General Plan is). 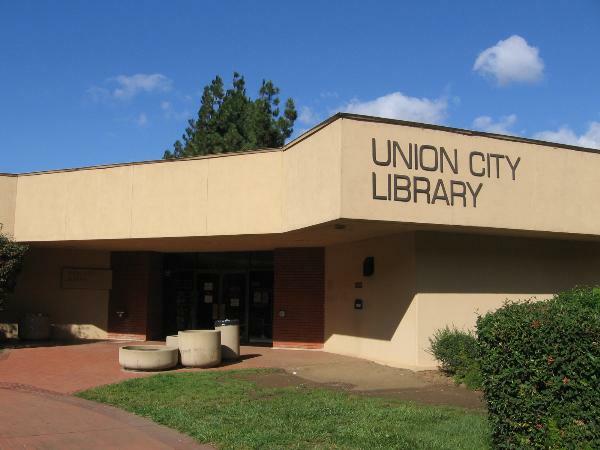 To maintain a high quality of life for Union City residents, the City must minimize natural hazard risks, such as earthquakes, wildfire, and flooding, as well as manmade hazards and nuisances, such as hazardous materials and noise. 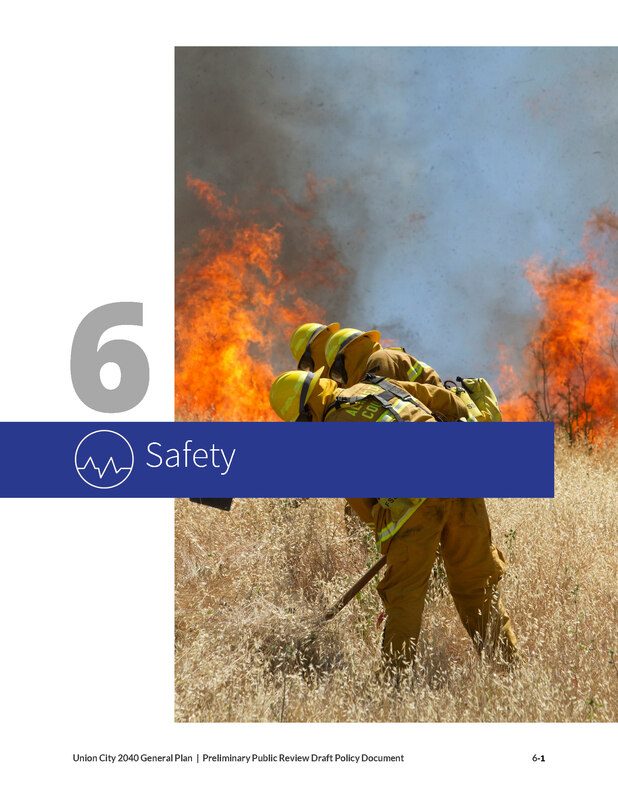 The Safety Element addresses these risks, and also addresses disaster preparedness and emergency response. The Safety Element is the seventh of nine elements in the Union City 2040 General Plan to be publicly released (click here to find out more about what a General Plan is). The purpose of the Resource Conservation Element is to preserve, protect, and enhance the natural and historical resources that make Union City a unique place, and addresses topics including habitat and open space, water resources, historic and cultural resources, air quality, energy conservation, and the reduction of greenhouse gas emissions. 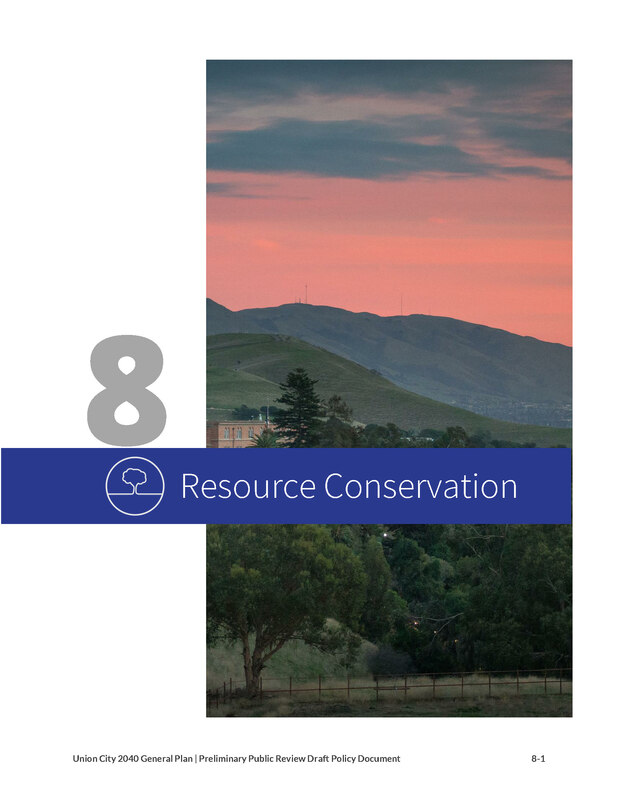 The Resource Conservation Element is the sixth of nine elements in the Union City 2040 General Plan to be publicly released (click here to find out more about what a General Plan is). The quality and capabilities of the facilities and services offered in a community can enhance the livability and economic potential of a community. This Element focuses on the variety of public facilities that are necessary to sustain existing households and businesses and to accommodate future population and employment growth. 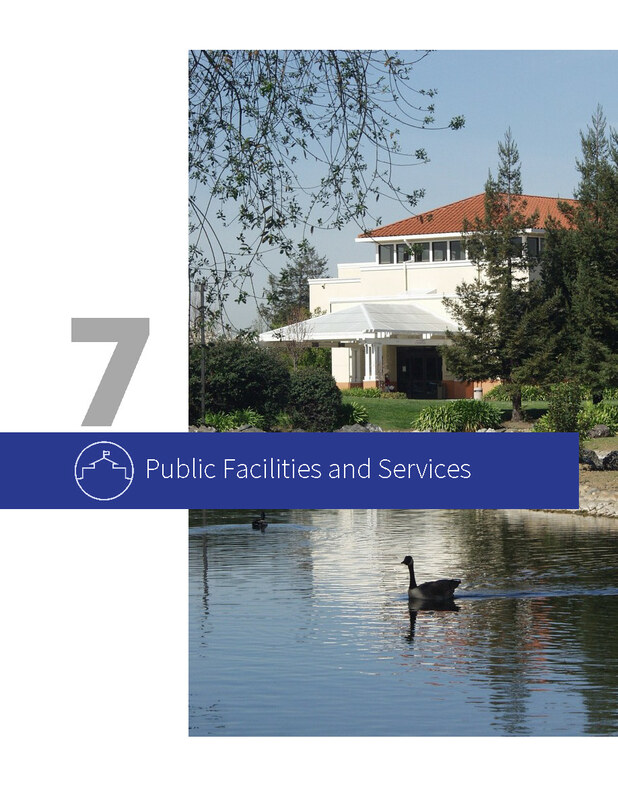 The Public Facilities and Services Element is the fifth of nine elements in the Union City 2040 General Plan to be publicly released (click here to find out more about what a General Plan is). Union City has a number of distinctive districts that serve as important commercial, employment, and residential areas. These districts are either key infill areas that provide unique opportunities for redevelopment during the life of this General Plan, or have important existing features that require special attention to preserve and protect. This Element contains policies specific to each of these special areas. 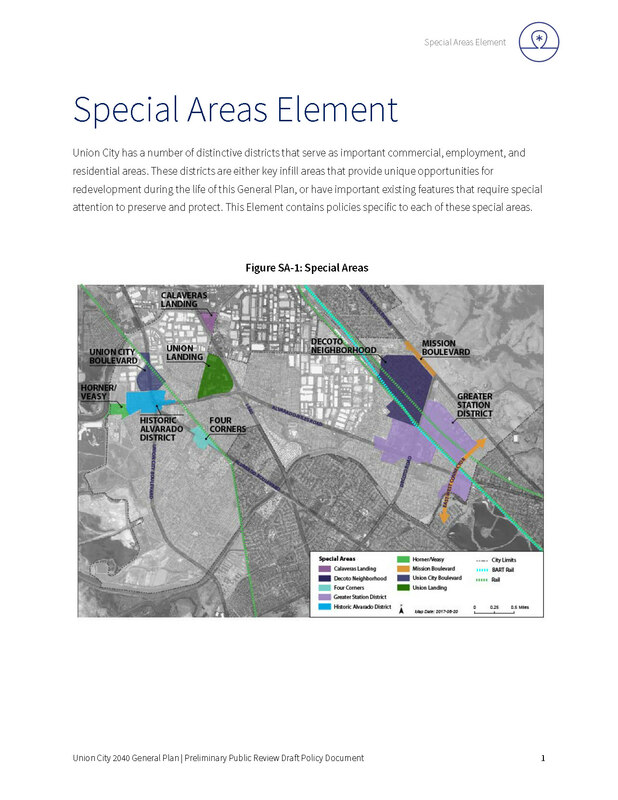 The Special Areas Element is the fourth of nine elements in the Union City 2040 General Plan to be publicly released (click here to find out more about what a General Plan is). An important aspect of a community’s growth is its physical character and how this structure can contribute positively to the community’s identity and support a strong economic base. Through community design, the City can build an urban fabric that strengthens its assets and brings coherence and identity to Union City. 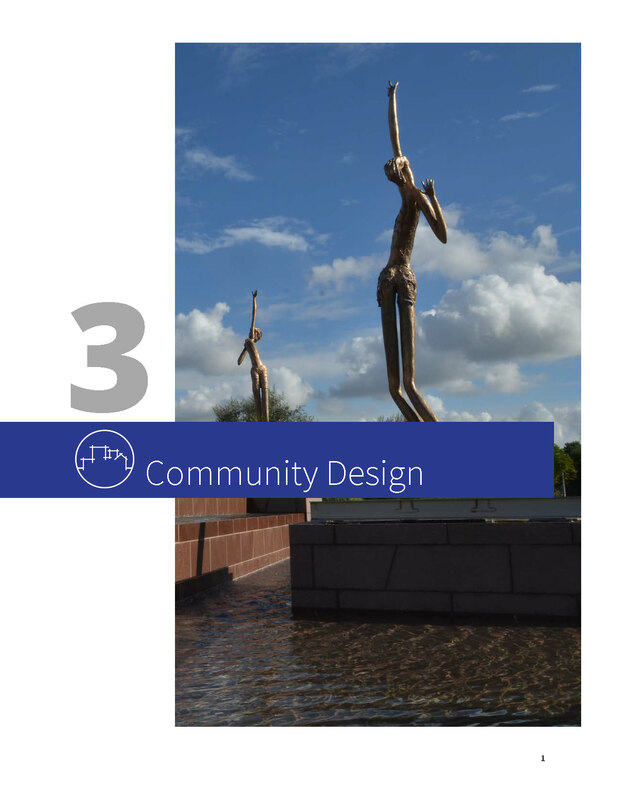 The Community Design Element is the third of nine elements in the Union City 2040 General Plan to be publicly released (click here to find out more about what a General Plan is). The Land Use Element contains the Land Use Diagram as well as the policies and standards that directly shape land use decisions and the resulting physical form of Union City. An underlying theme of this General Plan is to create quality places that improve the quality of life for residents and enhance the City’s fiscal stability, while preserving successful areas of the community. With limited opportunities for new development, every subsequent project will play an important part in enhancing the built environment. This General Plan seeks to ensure that infill development is done in a way that boosts the local economy, provides housing opportunities, brings jobs and services to the city, and creates quality places that enhance the experience for residents, workers, and visitors. 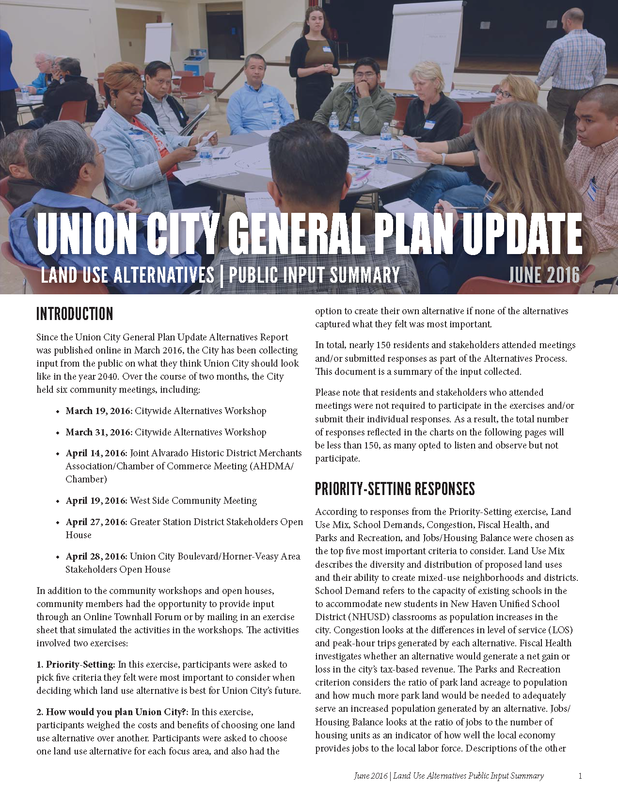 The Land Use Element is the second of nine elements in the Union City 2040 General Plan to be publicly released (click here to find out more about what a General Plan is). A strong economic and fiscal base is critical to developing and maintaining Union City’s prosperity. Union City has many locational advantages that make it a draw for business. In addition, the City’s cultural diversity, educated workforce, quality schools, low crime rate, relatively affordable housing, and relatively affordable commercial rents also make it an attractive place to do business. 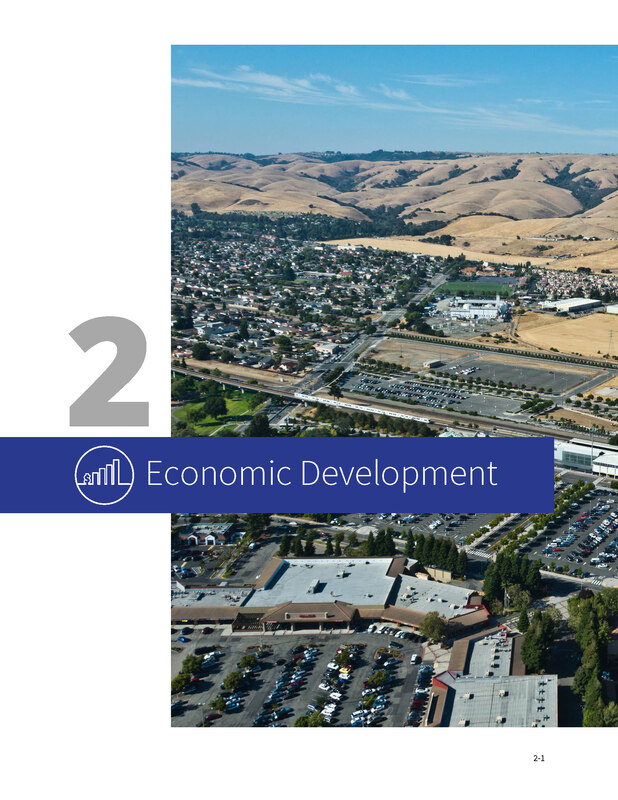 The goals and policies in the Economic Development Element support the continued growth of the local economy, increased fiscal solvency of Union City, and overall improvement in the quality of life for Union City residents. The Economic Development Element is the first of nine elements in the Union City 2040 General Plan to be publicly released. The Land Use Alternatives Public Input Summary gathers all the public input collected since mid-March. It provides a high-level overview on how participants ranked priorities and which land use alternatives were most preferable. The third edition of the General Plan newsletter summarizes detailed information from the Alternatives Report (see below). It provides a high level overview of the Focus Area and Citywide Alternatives, and briefly summarize and compare the benefits and impacts of the alternatives. The last two pages of the newsletter include a tear-off worksheet that you can use to identify which alternatives you like best. You can either mail or drop off your completed worksheet to the City. The City will accept your completed worksheet through April 29, 2016, for inclusion in the public outreach summary that will be presented to the Planning Commission and City Council. The Alternatives Report (and appendix) provides information about new land uses being considered for key areas within Union City. These new land use ideas have been organized into five citywide land use alternatives, including a land use alternative that reflects the existing General Plan. This analysis also takes a closer look at three Focus Areas, including the Greater Station District, the Union City Boulevard Corridor, and the Horner-Veasy Area. The Introduction and Background chapter describes the purpose of the General Plan and outlines the phases in the Update process. The Land Use Alternatives chapter first provides an introduction to the land use designations used to plan future development and second, presents Focus Area Alternatives and Citywide Alternatives. Maps of proposed alternative land uses are included, in addition to the amount of housing and employment expected to be generated from each alternative. Each Focus Area also includes an overview of the area and identifies development constraints and opportunities. The Citywide Alternatives Evaluation chapter provides a detailed comparison of the Citywide Alternatives. It evaluates the benefits and impacts of each alternative for selected criteria in the categories of land use, economic and fiscal conditions, transportation and mobility, infrastructure and services demands, resources, and hazards and safety. 4. The Focus Areas Alternatives Evaluation chapter evaluates and compares the Focus Area Alternatives. that will be used to analyze and compare the alternatives. You can view the draft land use concepts here. 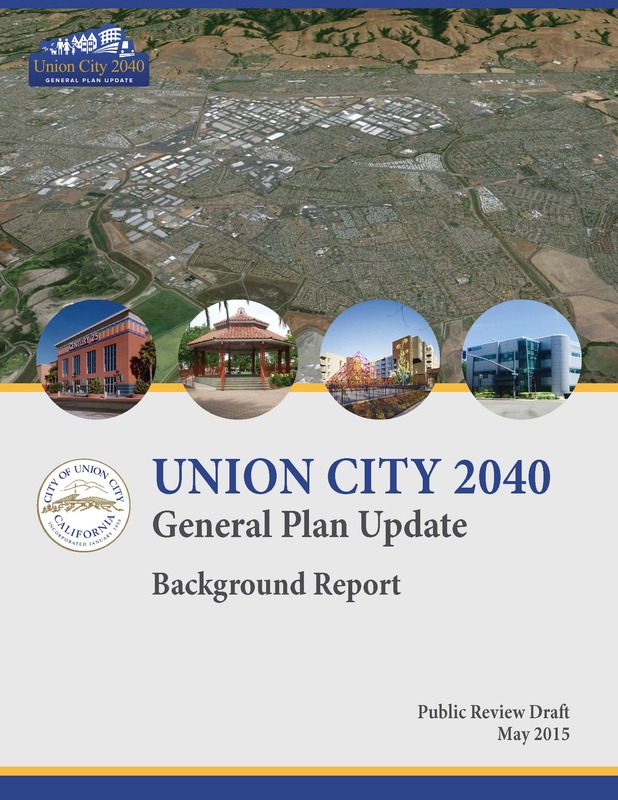 The General Plan Background Report takes a “snapshot” of Union City’s current conditions across a wide range of topics. 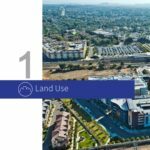 This report provides context for making land use and policy decisions, and is intended to be objective and policy-neutral. The Public Review Draft Background Report will remain a draft until the City adopts the updated General Plan. Until that time, the City will collect public comments on the Report. 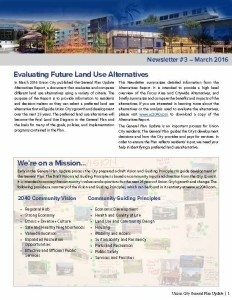 The second edition of the General Plan newsletter highlights the key assets, issues, and opportunities facing the city and provides an overview of the refined Vision Statement. 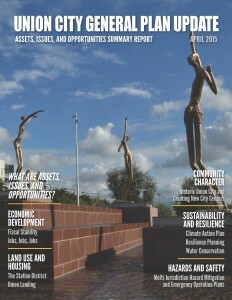 The Assets, Issues, and Opportunities Report provides a summary to facilitate important discussion on assets, issues, and opportunities in Union City. The Report is designed to focus the community’s attention on key topics that have major policy implications as the City considers how to grow and change over the next 25 years. The City anticipates that this Report will stimulate discussion and lead to confirmation and selection of courses of action to be reflected in the Alternatives Report and the General Plan Policy Document. The draft Vision Statement and Guiding Principles capture the City’s key values and aspirations for the future. The Vision Statement paints a picture of what Union City could be 25 years from now. 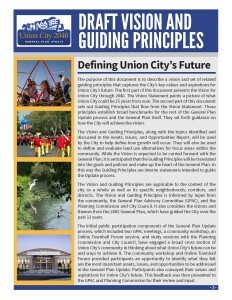 The Guiding Principles flow from the Vision Statement and establish broad benchmarks for the rest of the of the General Plan Update process and the General Plan itself. Both the Vision and Guiding Principles, along with the topics identified and discussed in the Assets, Issues, and Opportunities Report, will be used to define and evaluate land use alternatives within the community. 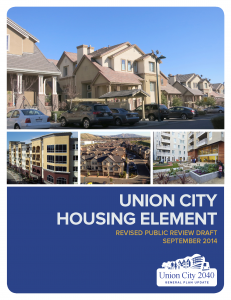 The Union City Housing Element addresses housing opportunities for present and future residents through 2023. The purpose of the Housing Element is to identify and analyze existing and projected housing needs in order to preserve, improve, and develop housing for all economic segments of the community. The Department of Housing and Community Development found the Housing Element in compliance with State law on February 19, 2015. This document provides a quick introduction to the General Plan process and suggests ways for you to get involved. Help us get the word out about the General Plan Update and share this resource with your friends and neighbors! 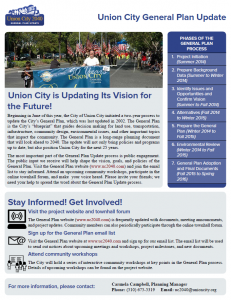 The first edition of the General Plan newsletter introduces the Update process, reports on the kick-off meeting, and shares ways for you to get involved. The current Union City General Plan was adopted in 2002. 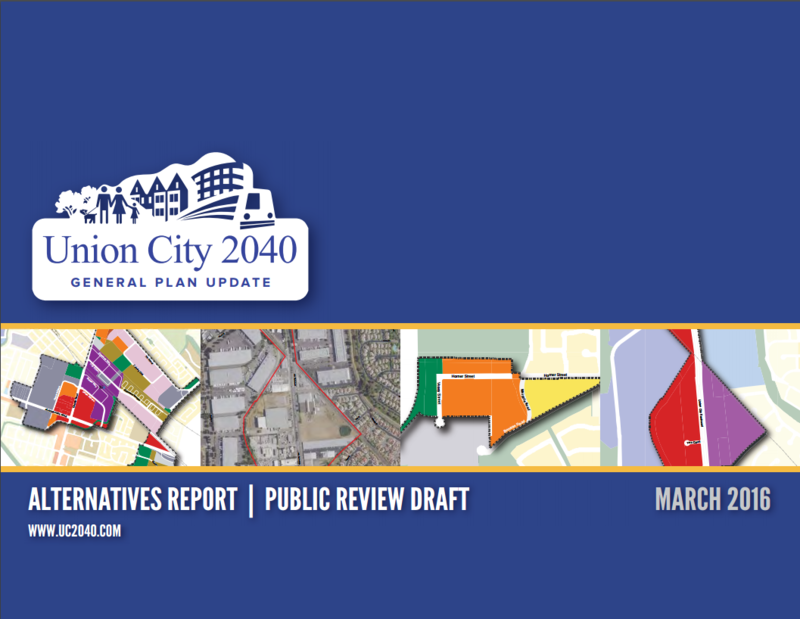 Once the Union City 2040 General Plan is adopted, the current General Plan will be archived and no longer in effect. Adopted in 2010, this housing element will be replaced as part of the Union City 2040 General Plan process.